Apple Inc. (AAPL) may have disappointed some fans and investors with an overly familiar looking iPhone 7. But next year is shaping up to be very different. Japan’s Nikkei Asian Review is reporting that AAPL is not only switching up to three iPhone 8 models, but that all three will drop the metal back to go all glass. In other words, for its 10th anniversary, the new iPhone will look completely different from what’s out there today. Including the dozens of smartphones — like Google Pixel from Alphabet Inc‘s (NASDAQ:GOOG, NASDAQ:GOOGL) and Galaxy S7 from Samsung Electronics (OTCMKTS:SSNLF) — that have clearly been influenced by the design Apple introduced with the iPhone 6. Hon Hai Precision Industry Co., Ltd.-ADR (OTCMKTS:HNHPF) — better known as Foxconn — currently manufactures the bulk of Apple’s metal case backing for the iPhone. It’s responsible for the iPhone 7 Plus, iPhone SE and a chunk of iPhone 7 orders. What Stocks Will Win the 2016 Election? Nikkei, however, claims Foxconn lacks the technological know-how to make the glass backs for the iPhone 8. It’s suggesting Chinese firms Biel Crystal and Lens Technology Co Ltd will get the nod from Apple Inc. to make this key component for the glass iPhone. That report also suggests AAPL is planning to move from a two model lineup to three with the iPhone 8. It’s not clear at this point whether the iPhone SE will continue to be offered, but it seems likely considering that the smallest iPhone 8 remains the current 4.7-inches. Apple has a history of offering all-glass iPhones. While most people today think of the the Apple smartphone as the one that launched the aluminum and glass look, 2010’s iPhone 4 and then the iPhone 4s featured glass backs. Shattered iPhones back then were common, which probably one reason why AAPL made the move to an aluminum back, starting with the iPhone 5. Almost all smartphone manufacturers, however, have switched to aluminum. With its 10th anniversary release, Apple Inc. wants the new iPhone to stand out from the crowd. It also wants it to look visually different from the 7 and 7 series to spur upgraders who’ve held onto their old iPhones because the new ones look the same. Going back to the glass front and back, held together with a metal band, would kill two birds with one stone in that respect. Apple presumably learned from the iPhone 4/4s user experience, and this time the glass back panel will be a little more resilient. Going with glass would also let Apple feature the glossy finish that has proven so popular with the Jet Black iPhone 7, without the same risk of scratches. The other interesting aspect of the Nikkei story is the move to three sizes from the current two for the iPhone 8. That would jive with earlier reports that AAPL was moving to a curved AMOLED display next year. In this scenario, the company would likely keep at least the 4.7-inch iPhone 8 (and possibly the 5-inch model as well) using the record-setting LCD display currently in the iPhone 7. 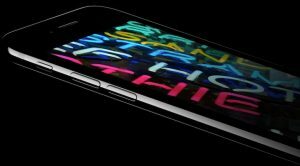 The 5.5-inch iPhone 8 would get the pricier curved AMOLED display and carry a premium price tag to go along with it. As would be expected, none of the companies involved (and certainly not Apple) are commenting. As usual, we’ll have to wait nearly a year to see what AAPL officially has cooked up for it’s new iPhone. Even this early in the game, however, hints are starting to emerge from its supply chain. It’s a safe bet the iPhone’s 10th anniversary will be a big release. Launching an all-glass iPhone 8 in three sizes would certainly help to drum up interest and could take Apple stock back to those glory days when people would line up outside the Apple Store for days waiting to snag one. As of this writing, Brad Moon did not hold a position in any of the aforementioned securities. Article printed from InvestorPlace Media, https://investorplace.com/2016/10/new-glass-iphone-8-aapl-apple-stock/.